These crisp and gooey Mini Tortilla Pizzas just need 4 ingredients and 10 minutes to come together. Bake ’til bubbly and golden in your muffin tin! Is it too late to talk about what happened last weekend? We’re in Wednesday after all, so I may be missing the boat on this one. But, I’ve finally caught my breath from the excitement and wanted to let you know. My friends threw me a beautiful baby shower on Saturday. 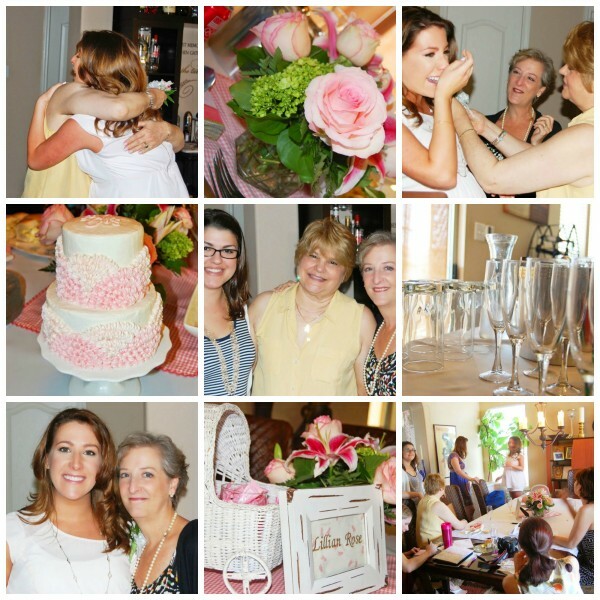 There was champagne, pink cake, good food and lots of laughs… but also some tears! That is, my tears POURING down my face after I found my mom, mother-in-law and sister-in-law standing in the kitchen waiting to greet me. I hadn’t seen them in months, and they had flown in from all across the country just for the big event! It was an unbelievable, unforgettable (and very tear-filled) surprise that had me mopping mascara off my cheeks and crowning my honey Husband of the Year for organizing it all. The man may not surprise me often, but when he does, he sure gets it right! And for that, he gets a whole lotta praise. And pizza. The only other thing more abundant than gifts at the shower were the mini treats! I love me some tiny-portioned goodies, after all. They make you feel like you can eat dozens guilt-free. Or while feeling guilty. Either way, you’re gonna eat them. 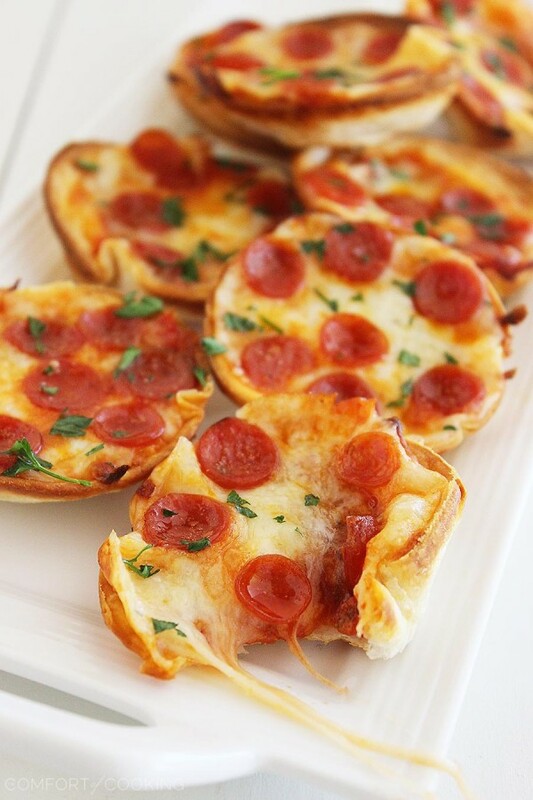 They’re mini and cute and delicious, and in this case, full of cheesy pizza goodness! Perfect for the preggos in your life, and the men. Everyone wins. All you need to whip up these wonderful little pizzas is 4 ingredients, plus a sprinkle of parsley if you’re feeling fancy. Feel free to substitute the pepperoni for whatever you like, or add on to it! Just pop a handful of tortilla rounds into your mini muffin tin, sauce ‘em up, sprinkle on the cheese, and add your tasty toppings. Bake until bubbly and golden, and you have an irresistible treat for parties, lunches and fun dinners that call for something different. These pizzas are super cheesy, super easy, and guaranteed to fly off the platter! You’re gonna just love them. We sure do! Preheat oven to 400 degrees F. Lightly grease cups of a standard size 12-cup muffin tin. Using a cookie cutter, cut 2-3 rounds from each tortilla. Press each round into muffin cups. Add a teaspoon of pizza sauce into the center of each tortilla round. Sprinkle cheese on top, then pepperoni pieces, or your desired toppings. Bake for 10-12 minutes, or until golden and bubbly. Sprinkle with chopped parsley or basil, if using. Let pizzas cool slightly before removing to a serving plate. Substitute whole wheat tortillas for flour tortillas in this recipe, if you’d like. These are delicious with any toppings you desire! Get creative with yours. So glad you had a wonderful baby shower, Georgia!! 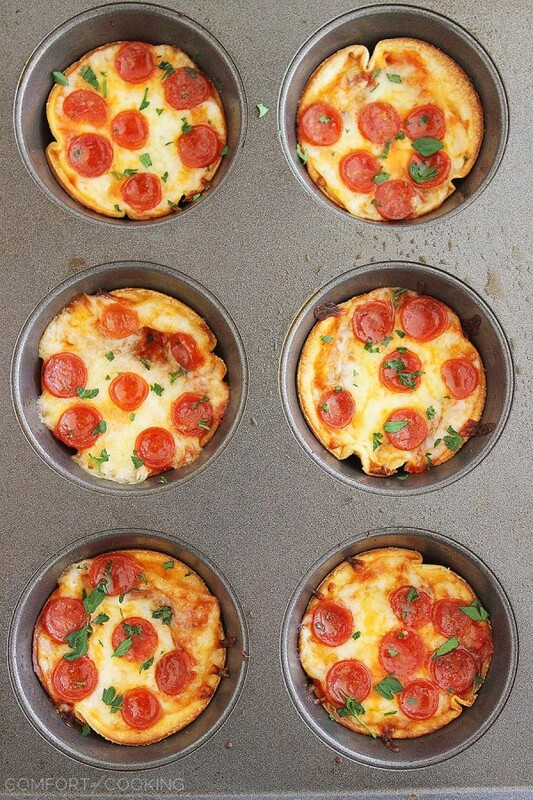 Love these little pizzas… never thought of doing them in muffin tins – great tip!! Sounds like a lovely baby shower. What a wonderful surprise. Good luck with everything down the home stretch! : ) Mini food is the very best. These pizzas are adorable. This is such a great idea!!! Its fun, and perfect for a party. Thanks for sharing! These would go really great at a house party! I absolutely love mini pizzas. I love this idea. I get to eat more than 6 don’t I? Oh, what a wonderful day you had! What a terrific surprise! And these little tortilla pizzas are so cute — I love the idea! Definitely something I’d like to try sometime — thanks so much. How sweet! I could eat at least 6 of these awesome little bites! Georgia, I love knowing that your hubby planned a surprise baby shower for you! Hubby of the Year, indeed. :) I’m so glad you had such a good time. These appetizers are just perfect! I don’t know anyone who doesn’t love pizza or tortilla anything. Gret for parties any time of year. Thanks for sharing, my friend! These look SO SO GOOD! It’s so great that your husband planned such an awesome shower! You deserve it! What a great surprise! So fun that you got to spend time with your family! 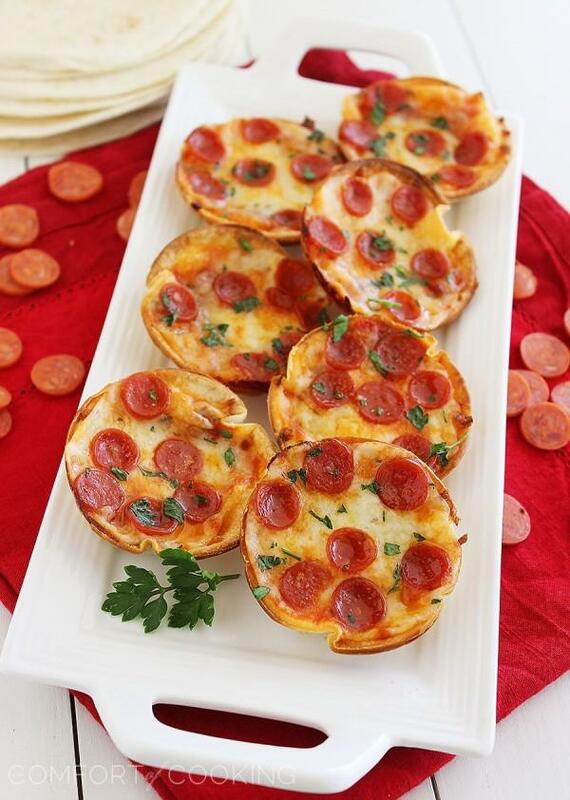 Love this idea for mini pizzas! That is awesome – so sweet! What fun food for everyone to enjoy! Awww how sweet!!! What a wonderful surprise! Love these adorable little pizzas. Undeniably cute. Sounds like a wonderful baby shower, Georgia. 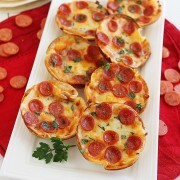 Those mini tortilla pizzas look mouthwatering! 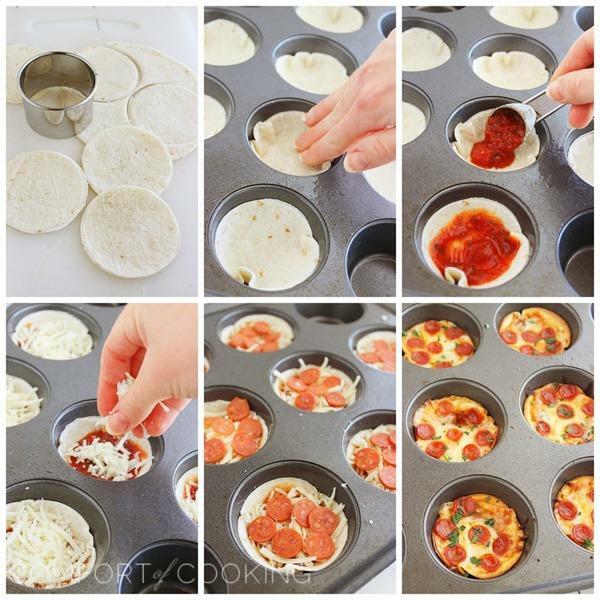 I love making tortilla pizzas, but the idea of making them mini and in the cupcake pan to make them all at once is genius! I can’t wait to make these! What a wonderful surprise for you! I love mini treats, too. I haven’t even seen mini pepperoni before! Will definitely be on the lookout next time I’m at the grocery store. These look sooooo good and prefect for a party. Your story of the baby shower-that was so sweet and made me tear up girl! Love this recipe, will definitely be making it next party I have! So sweet! I’m glad he was able to pull of the surprise :) These look so great for an easy, crowd pleasing snack. WOW talk about easy breezy pizza. Thanks for sharing!!! Such a fun surprise and these tortilla pizzas are the perfect bite! What a wonderful surprise! 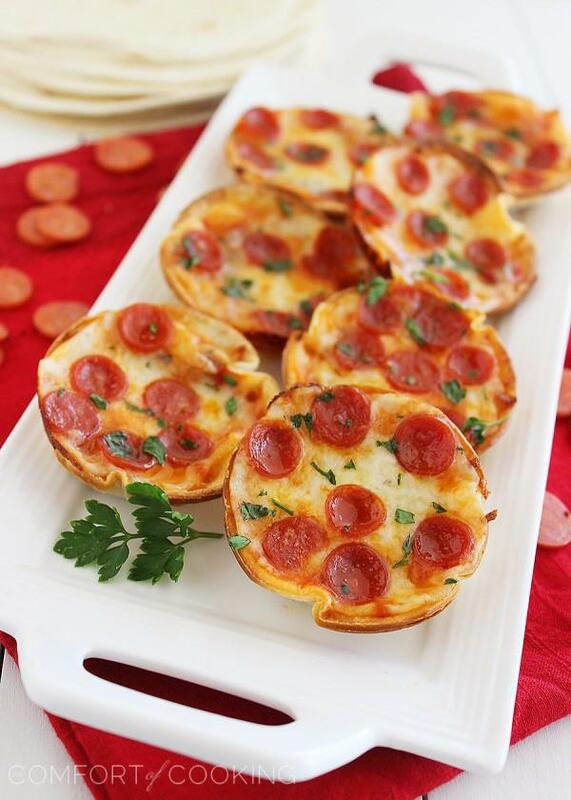 These little pizzas look awesome & the perfect little party snack! And these pizzas look AWESOME. I love tortilla pizzas. Mine have never been so cute, though! These were the best tasting 30 minute (total prep) finger food meal I’ve ever done. Will try next time with marinated artichoke pieces.